Anyway, before making these, I did an internet search for how to patch jeans. I came up with several sites and none of them seemed to be what I wanted. 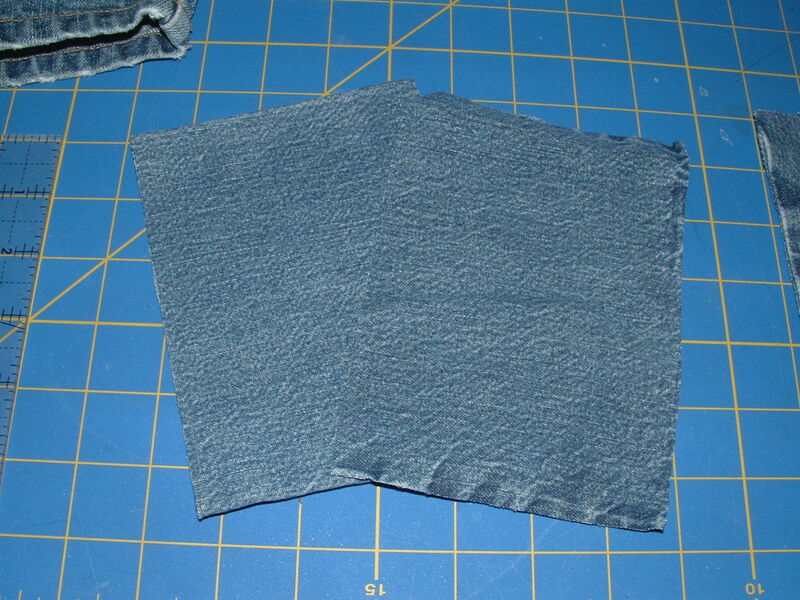 There are a lot of different ways to patch jeans out there, so I don't pretend that this is the "right" way...just one of many to consider when you're doing your own patches. 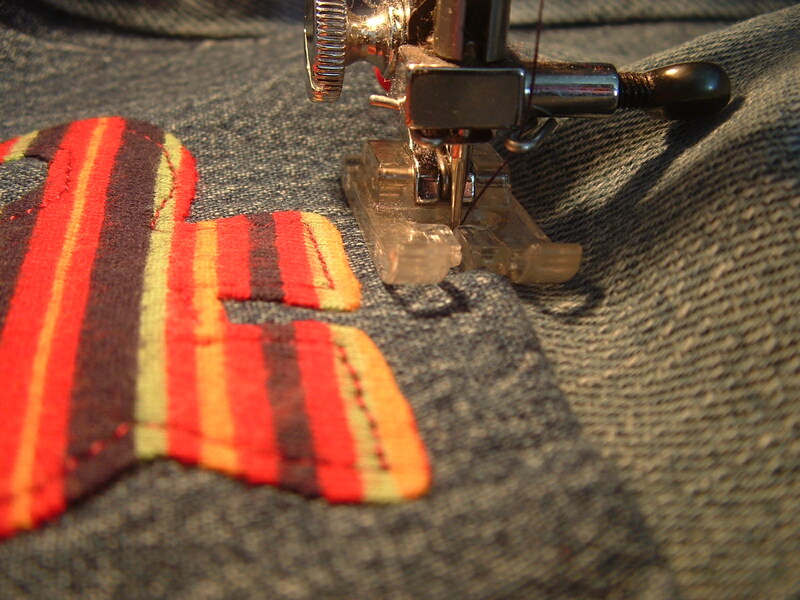 I had two main considerations when I started this project. 1. 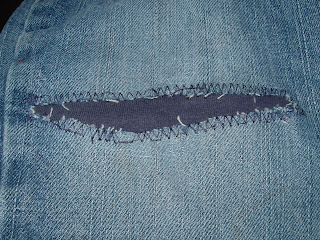 I wanted to patch it well enough that the hole would continue to grow out from under the patch. 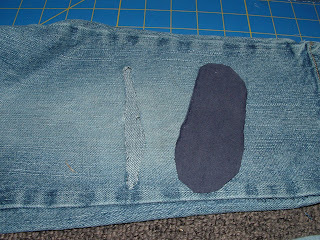 That meant the patch had to be big enough to cover the thinner, weaker fabric that is usually next to the hole itself. 2. I wanted it to look cute without getting too bulky. 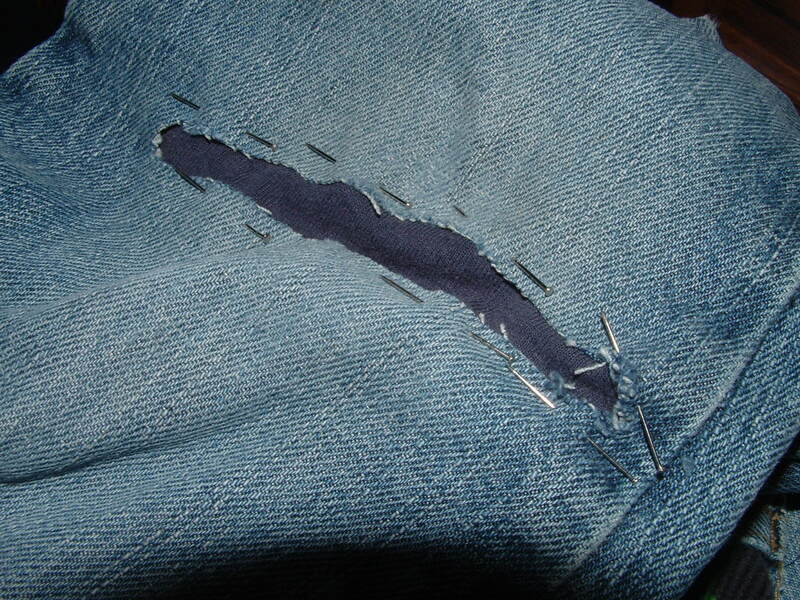 Next, I patched the hole itself with some scraps from an old T-shirt. I wanted something that would be soft and not add much bulk. 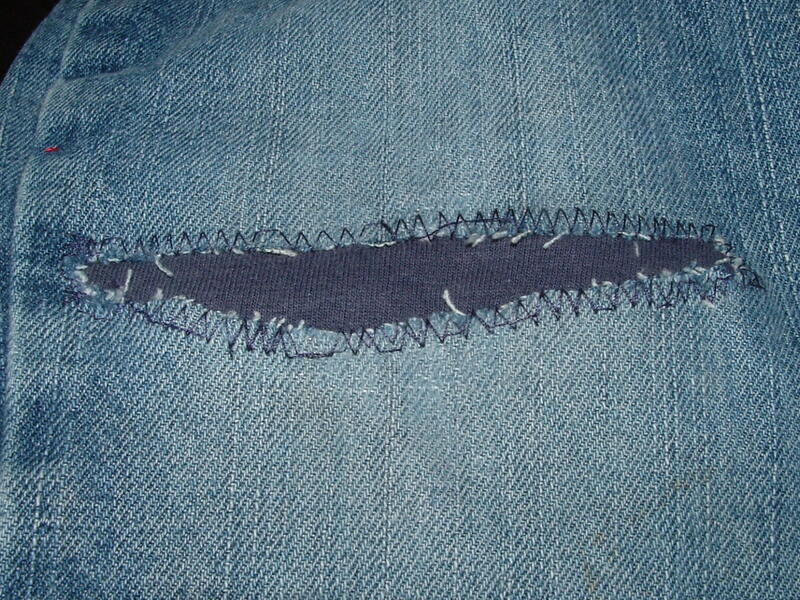 I did this because this hole was so large and seemed fairly likely to continue splitting. 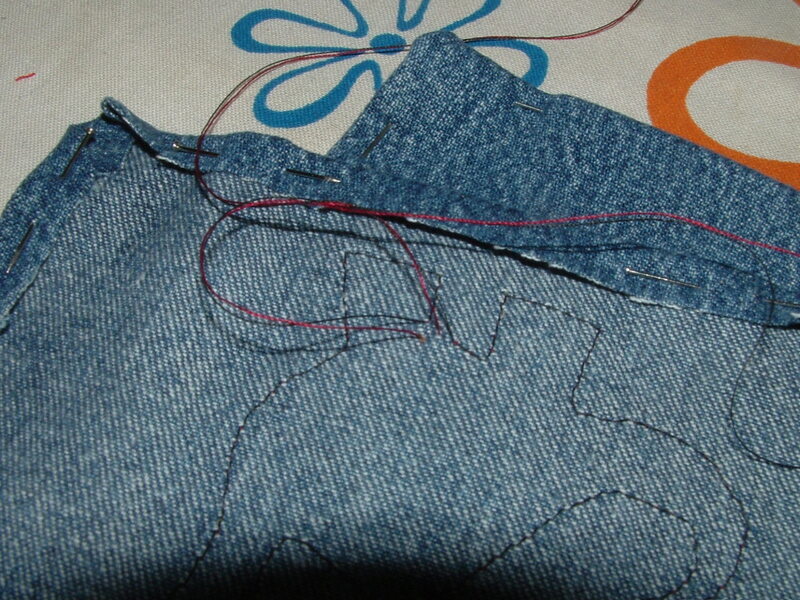 I trimmed the extra strings out of the way and cut a piece of T-shirt bigger than the hole. 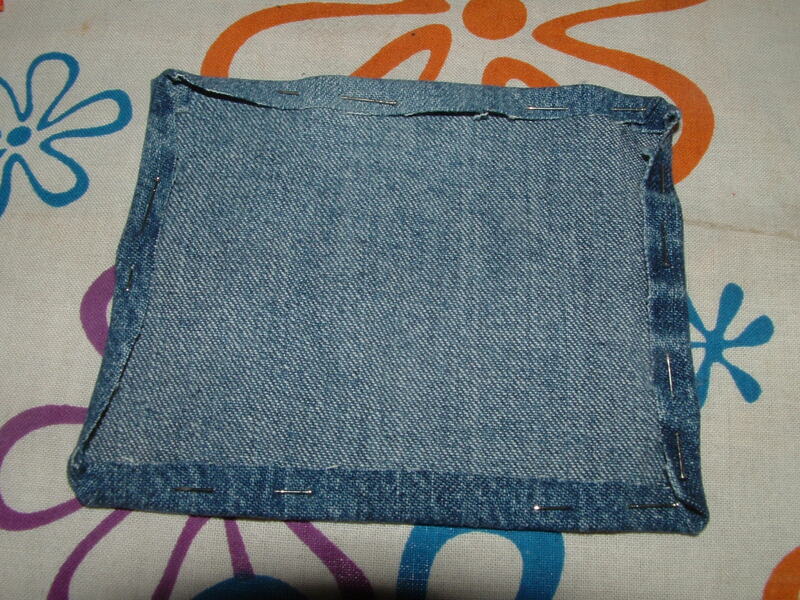 Then with the T-shirt fabric on the inside, I pinned it really well. Then I zigzagged around the edges. I removed each pin before sewing over it. 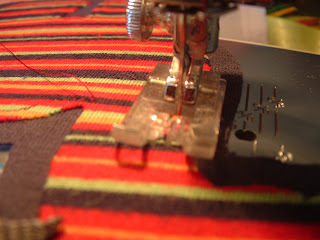 I often sew over pins...but not when zigzagging. It's not particularly pretty...but that's okay because it won't show. 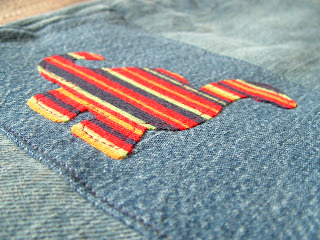 To get the patch ready, I used some denim scraps from this jeans rehab project. I cut them as big as I could since the hole in the jeans was pretty wide. 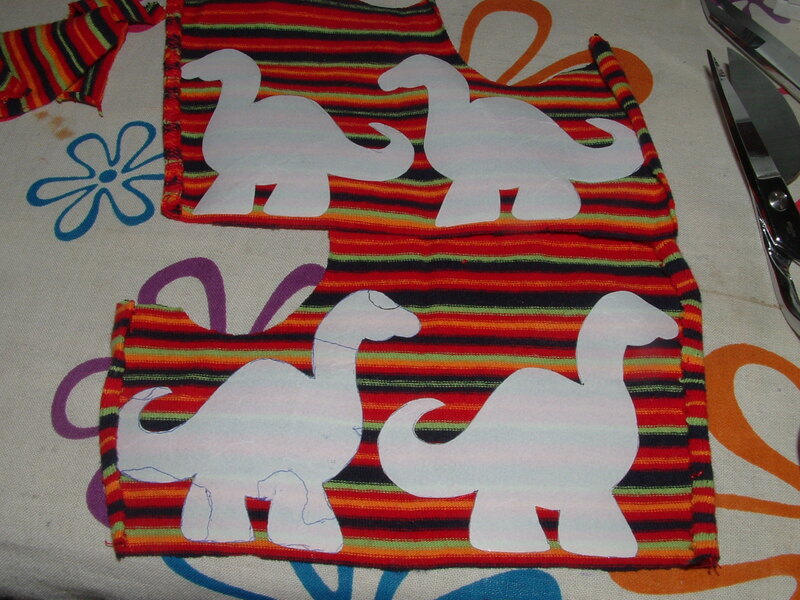 Then I traced the dino shape onto the papery side of Heat'n Bond Lite, cut them out, and ironed them onto the WRONG (as in the back) side of your fabric. I was using too-small shirt from the thrift store. I liked the idea of having the dinos facing different directions (and you can see I was making an extra set for the giveaway.) I used a design I saw on Little Lizard King for the dino shape. Click here for the post on Little Lizard King with the printable pattern. I left the ends long and pulled them through the back, so I could tie them in a knot. 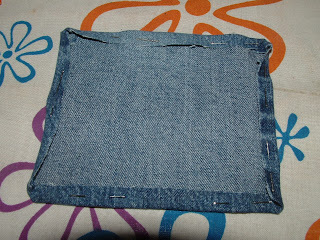 Then I ironed the edges of the patch under and pinned them to help hold them down. Once I had the patch ready, I cut a rectangle of Heat'n Bond Lite that was just small enough to fit on the back of the patch, but not the parts, I'd folded under. The regular Heat'n Bond would probably be even better for this, but I didn't have it. 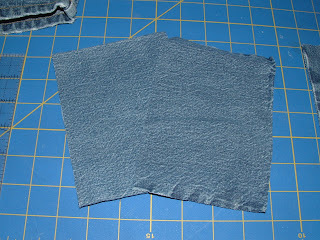 Then peel off the paper backing. 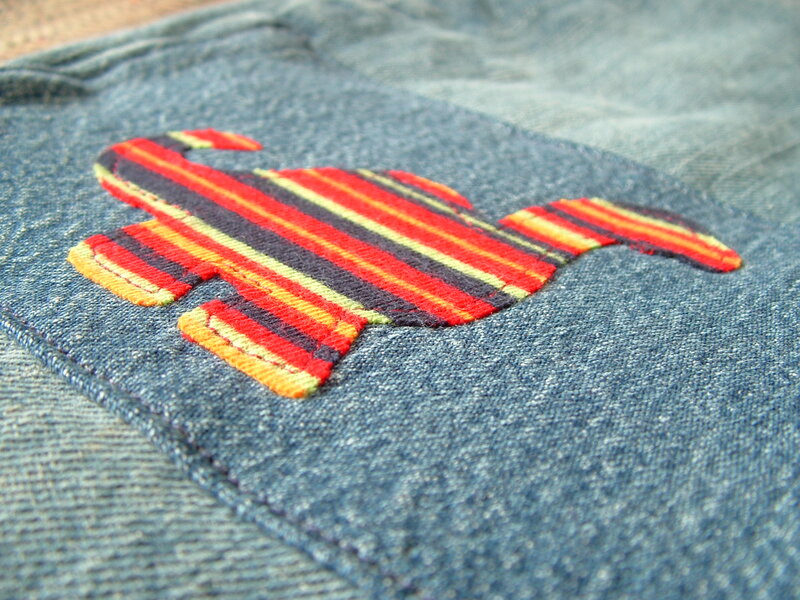 Pin your patches onto your pants. 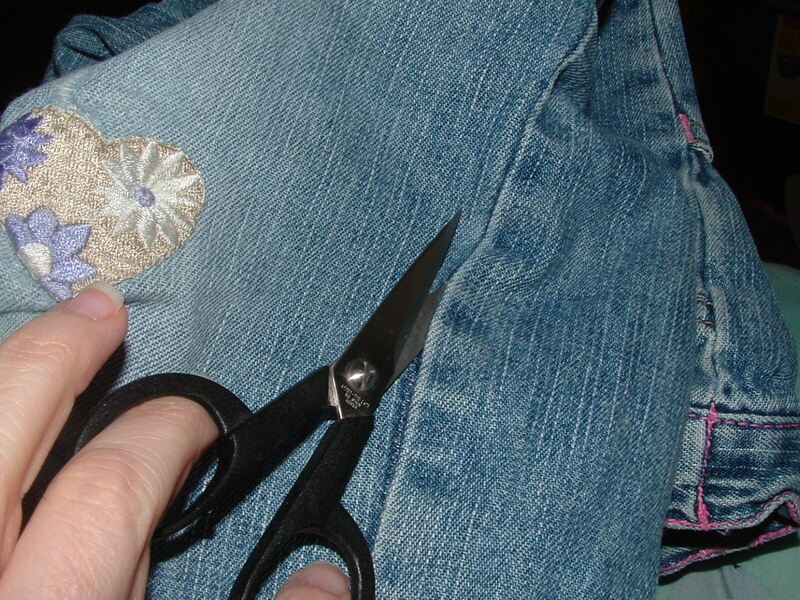 I highly recommend measuring them to make sure they're even if you're doing patches for both knees. 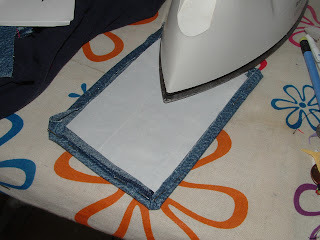 Once you're sure you've got them where you want them, iron well both on top and from the back. 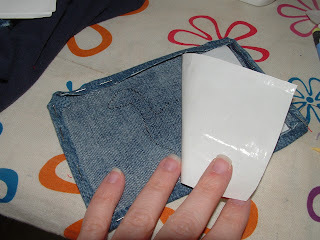 Sew around the edges of your patches. 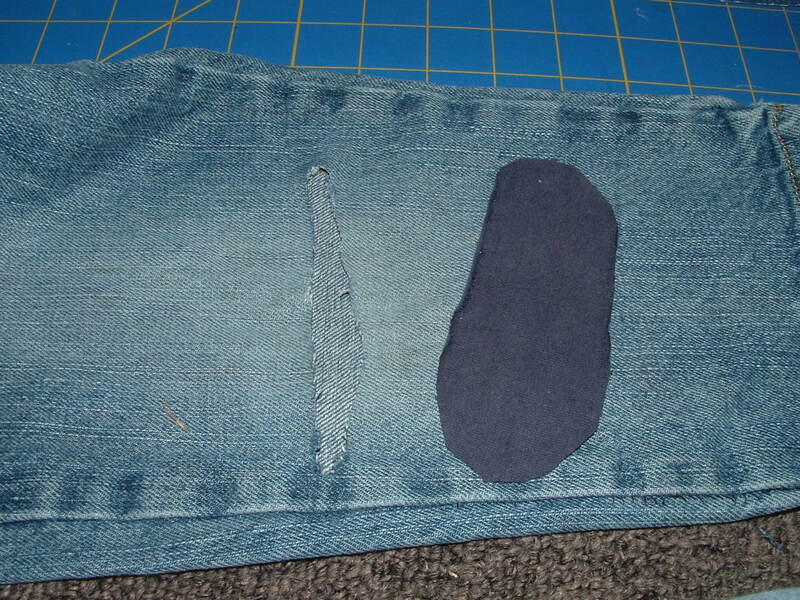 Pin and re-sew the original leg seam. 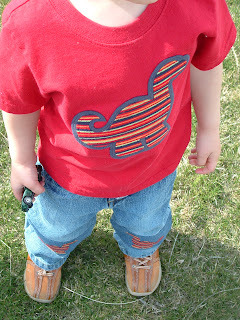 You can see the tutorial for the shirt here. Check out my top right sidebar for lots of other Hand-Me-Down REHAB ideas and techniques. 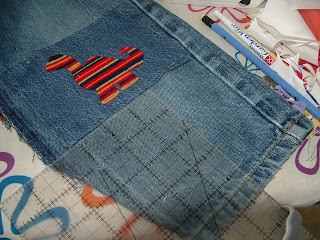 And it's been so fun to see all the Hand-Me-Down REHAB projects you've been entering! Keep them coming and I'll be doing a highlights post soon! Grab a button for your blog post or sidebar and link up! Genius! I don't know why it never occurred to me to open up a side seam when the kids were little. 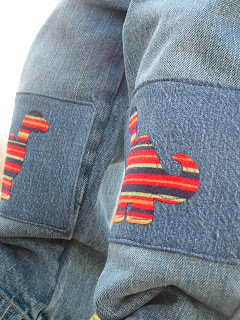 And I really like the dino pattern. Super cute and creative! Thanks for the tutorial. 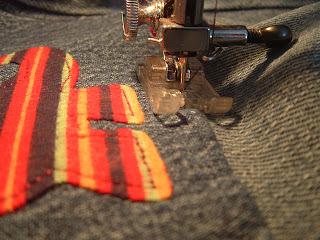 If you want, stop by and link up sometime for my Thursday Make It Wear It party for all things made to be worn! You make great stuff! Thanks for sharing this detailed tutorial! Love it! I have recommended your post to another great blog I discovered today. 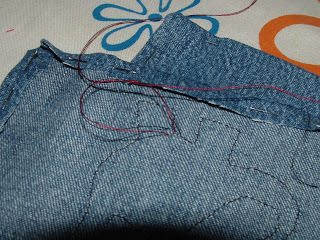 They have been having some discussion about repairing holey jeans, and I thought this post! I love this idea but I tried to do it today and my little guys jeans are too tiny to fit in my machine, any ideas besides sewing by hand. 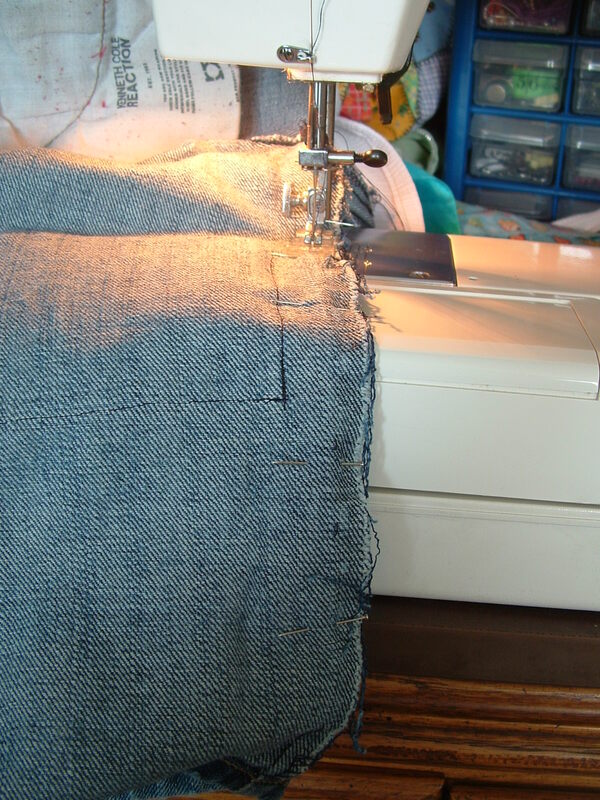 I'm new to sewing so I might be missing a trick. He wears 12-18 months.